It’s true, I have a bit of an obsession with fig trees. I think it has to do with the challenge of growing figs up here (zone 6b this year, 7a most years). Plus, if you haven’t tried one, a fresh fig is hard to beat. What’s great is that figs are easy to propagate from cuttings! As I write this there are approximately 150 fig trees at various stages of rooting and growing in my basement (hey, what else am I going to do in the winter?). For several years now I’ve been looking for a cutting rooting method that gives the most bang for the buck. 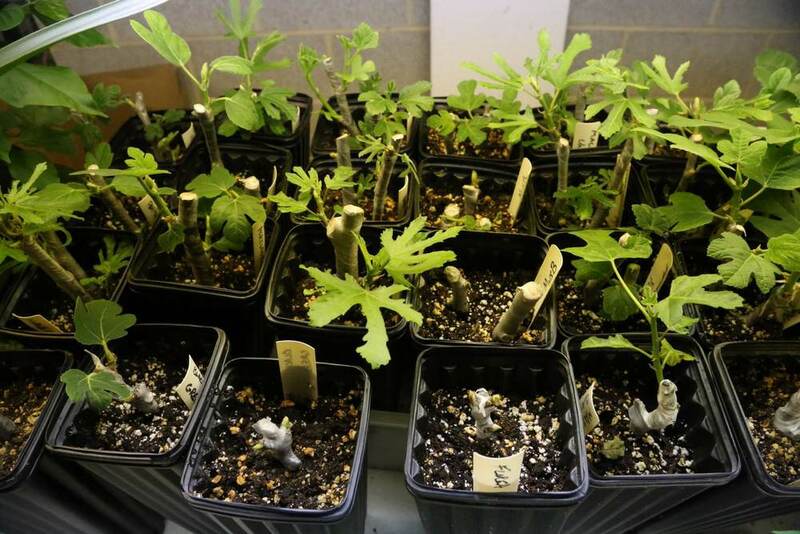 Go ahead and google ‘fig propagation’ and you’ll find a variety of techniques. Some of these have you sterilizing your cuttings, setting them in a plastic baggie with a moist paper towel, in a container with damp sphagnum moss, or in a water bottle. I’ve experimented to some degree with most of these before and found them somewhat wanting. Many seemed like a whole lot of work for a not-so-great success rate. By all means, find a method that works well for you on a consistent basis. I’ve been searching for a method that satisfies the following requirements and I think I've found it. I use 4x4x9 Stuewe Treepots for the pots, straight Pro Mix BX for the potting mix, and the 1" parafilm available on eBay. I’m told fall is the best, as the sap flow is into the roots at this point and is preferable to taking cuttings in the Spring when sap is flowing upward. Cuttings from this year’s growth seems to work well (wider than pencil width up to probably 1” in width). This year’s growth is the most susceptible to dying in the winter anyways, so I don’t feel bad cutting it off. As long as the base of the tree survives in the winter, the tree seems to bounce back the next year. Cut a whole branch and worry about cutting it into pieces later. I use 4x4x9” treepots as I can fit the most under grow lights and it offers a lot of soil surface (height) for roots to shoot out. I use Pro Mix BX or Berger BM1 or OM1. It’s readily available here, fairly inexpensive, didn't contain fungus gnats like I've seen with other mixes, and seems to work well. You can add a little coarse perlite if you feel it’s too “heavy”. I haven’t seen much of a difference in success rate with just straight Pro Mix but adding perlite may help with overwatering issues. The downside of extra perlite is that the mix dries out more quickly so you need to stay on top of watering once the plants begin growing. Parafilm prevents the buds and wood from drying out prematurely. Since the parafilm breaths mold never forms. The stuck cuttings aren’t placed in any sort of humidity dome. Parafilm stretches really well, make sure to stretch it well over the exposed buds. The pressure of the swelling and opening bud will break through the parafilm as long as it’s stretched well. Parafilm is the only “odd” supply needed here. I use the 1” width and find cheap rolls on eBay. 1 roll should do 100+ cuttings as you’re only covering the tips. Remove the parafilm later in the year while potting up when the new tree has outgrown its pot. 5. Stick the cuttings in the soil and thoroughly wet the soil until water runs out of the bottom. If you have a large number of cuttings (like we often do), you may pre-wet the soil, let the water drain out thoroughly (sometimes overnight), then stick the cuttings. What I'm getting at here is that you need not always stick the cuttings beforehand. It may actually be beneficial to water the pots beforehand as the soil often settles while watering and may expose some of your wrapped cutting. Most of the time we stick more than one cutting in each pot. That way if a particular cutting isn't healthy, we have a backup. We've done as many as three cuttings in a pot without any detrimental effects that we've seen. We view it as a bit of added insurance and a way for a tree to start out with multiple trunks. 6. Water as needed, and only as needed. Remember that cuttings starting out don’t need much water. You're just trying to maintain high humidity in the mix to force the cutting to push out roots. Don’t fret if a newly pushing out cutting loses a leaf or two. I’ve seen them recover. Once a cutting is growing vigorously (has put on and kept 4-5 leaves) it’s far less sensitive to overwatering so feel free to water it well. That’s it! Seems like a lot, but there’s no babying, no monitoring (besides for water), no mold issues, no supplies beyond potting mix, pots, and parafilm. I’ve only found one: you can’t monitor root development. I think this is likely a really good thing, as formation of roots (or lack thereof) probably causes premature action to the detriment of the cutting. As of approximately 6 months into the cutting process, my success rate is 142 rooted out of 152 total cuttings, or about 93%. Check out our Store to see what's available for purchase from the rooted cuttings this year. At least half a dozen cuttings were pegged for being dead but ended up surviving. They originally pushed out a few leaves that withered and fell off. In many cases these cuttings shot up growth from below the soil level a month or so later after I set them in the "probably dead" pile. Pictures are worth a thousand words, so check out some of the photos below to see growth progress and some shots of the parafilm wrapping. Cuttings pushing out their first set of leaves. Notice how the buds just push through the parafilm. The cuttings a few weeks later. I use simple shop lights for lighting as they seem to be the most cost-effective. Fixtures at the big box stores can be found for around $10 and the bulbs are inexpensive as well. New healthy fig trees 4-5 months in. Most cuttings were started in December and January. ProMix HP: Experimented with ProMix HP (high porosity) versus BX. Found no discernible difference in success rate. ProMix BX is easier to obtain here and cheaper so I'll stick with BX. Success Rate: Around 90%, with over 400 plants grown from cuttings. This is lower than last year but was somewhat expected that I'd lose a few more due to the number of plants. Don't give up too early: Some plants will push out a leaf or two only to drop it. Many of these recovered and pushed out more leaves with no intervention (humidity chambers, etc). Lighting: Position the lights as closely to the plants as possible, moving them up only as the plants begin to grow into the lights. We use cheap T12 shop lights (around ~$10 at a home improvement store) and hang them from adjustable chains. We use daylight bulbs (5000k) but I'm not certain that it really matters. We look for the highest lumen output per bulb. Lights are on for 16 hours a day. Pomegranates: We rooted a number of pomegranate cuttings using the same method and found that they had a hard time pushing through the parafilm. We rooted several in the spring outdoors with no parafilm at all and they did very well. Next year we'll either avoid wrapping over the bud or wait until late spring to root them. Higher Temperature Rooting: We rooted in a different basement this winter that maintained a temperature around 77F. This did cause many cuttings to push out and grow much faster, but it did not have an effect on our success rate. I believe humidity may have been less than 30% with the elevated temperatures. Success Rate: I did not keep official totals this year but simply counted my discarded plants. I ended up once again with around a 90% success rate. I do double-stick my cuttings at times (2 cuttings per pot) as a bit of added insurance. ProMix BX: This potting soil remains my favorite though I'm going to try a Berger OMRI-listed mix this coming year for the sake of comparison. I like this general-purpose mix as is heavy enough to hold a decent amount of water but not rot my cuttings. With a 3.8cu ft compressed bale I can pot up around 120 cuttings. Fertilizing: This year I fertilized my plants when I could tell they had really taken root and were starting to grow. For me I used 3 strong leaves as a guide. For fertilization I use a slow release general purpose fertilizer to get them going. I did not measure exactly but probably initially added about a teaspoon or two per plant and added more when the plants seemed to need it. Fungus Gnats: These little beauties aren't much of a problem since I use the compressed bales and that don't seem to harbor any eggs for these guys. For added insurance (or when I do see a couple), I add a product called Mosquito Dunks to my watering can. From what I can tell, the Bt in the product takes care of the gnats just fine. Terminal Buds: If you have a cutting taken from the end of a branch, it will have a terminal leaf bud (the pointy bud at the end of a branch). I've read that these can cause issues with perhaps delaying or inhibiting rooting but I'm not convinced. I do remove the terminal bud, but only because it's tricky to wrap. What Hasn't Changed: Lighting, parafilm use and technique, initial care with watering, and 4x4x9" treepots remain the same. I'm happy with the overall growth of the trees so I'm not inclined to change much of the method. Success Rate: I did not keep official totals this year but I believe we only had a single plant fail to thrive, meaning a success rate of 99+%. It may be that this year was an anomaly, but I think a 90+% success rate is very achievable with this method. This success rate may be attributable to the change in potting mix but it's too early to tell. Average Temperature Rooting: We recently switched heating systems and that has meant our basement has actually run cooler than normal. To supplement heat, we actually ran a space heater by our rooting tables to keep the temperature around 70-75 or so degrees. Berger OM1 Potting Mix: We switched to this Berger OMRI-listed mix this year and were very happy with it considering our success rate. Is it all that different from our old standby, ProMix BX? Probably not. I do like that it's OMRI-listed (though we still supplement with time-release conventional fertilizers). In retrospect the decision to do a wholesale switch was somewhat risky considering our lack of experience with the product but we were pleased with the results. Sticking Multiple Cuttings: One thing we haven't mentioned before is the fact that we often stick multiple cuttings per pot (2-3), if we have the cuttings for it. 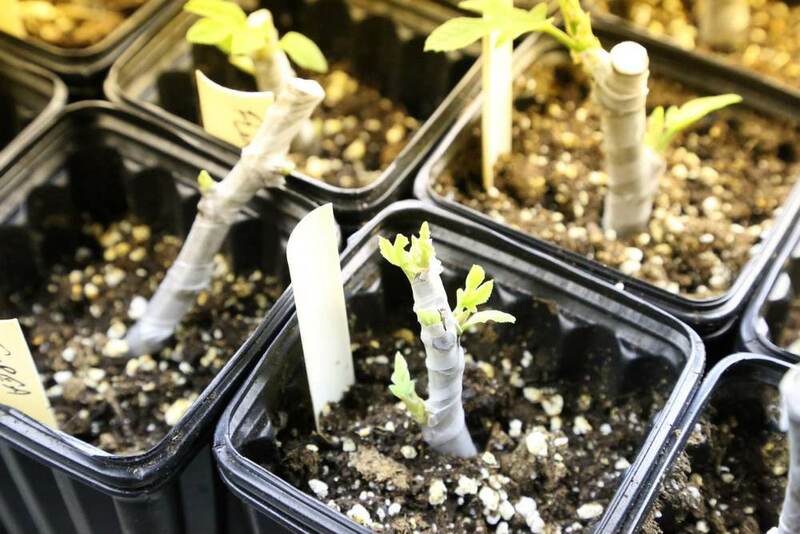 This not only contributes to our success rate, since one bad cutting doesn't ruin the chance in a pot, but in the case where 2 or more cuttings "take", we start out with a multi-trunked tree, which is our preferred method of growing. It also makes for a larger plant to sell to the public.